"The sea closes up, and so does the land"
My review-essay on Richard Ford's Frank Bascombe Trilogy can now be read at ReadySteadyBook. Here's a passage in Kafka's diary from February 2nd, 1920. He remembers a picture that represented a summer Sunday on the Thames. The whole breath of the river was filled with boats, waiting for a lock-gate to be opened. In all the boats were gay young people in light, bright-coloured clothing; they were almost reclining there, freely abandoned to the warm air and the coolness of the water. They had so much in common that their convivial spirit was not confined to the separate boats; joking and laughter was passed from boat to boat. He now imagined that in a meadow on the bank - the banks were only faintly suggested in the picture, the gathering of boats overshadowed everything - he himself was standing. He was contemplating the festival, which was not really a festival at all, but still one could call it that. He naturally had a great desire to join in, indeed he longed to do so, but he was forced to admit to himself that he was excluded from it, it was impossible for him to fit in there; to do so would have required such great preparation that in the course of it not only this Sunday, but many years, and he himself, would have passed away; and even if time here could have come to a standstill, it would still have been impossible to achieve any other result; his whole origin, upbringing, physical development would have had to be different. So far removed, then, was he from these holiday-makers, and yet for all that he was very close to them too, and that was the more difficult thing to understand. They were, after all, human beings like himself, nothing human could be utterly alien to them, and so if one were to probe into them, one would surely find that the feeling which dominated him and excluded him from the river party was alive in them too, but of course with the difference that it was very far from dominating them and merely haunted some darker corners of their being. What has this to do with Frank Bascombe? Well, he too is far removed from yet very close to the life he sees around him. He too believes he requires great preparation to fit in with those less dominated, less haunted by distance. The trilogy might well be that preparation. But there's a closer connection between Kafka's He and Ford's Frank. 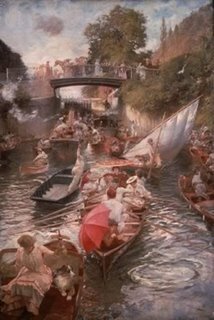 The picture being observed is Boulter's Lock, Sunday Afternoon by Edward John Gregory, a location "just below Maidenhead" according to my German edition of the diaries. And where of all places does Sally Caldwell, Frank's second wife, end up after leaving Wally, her first husband? Take one guess. Sometimes I feel like those old men Gulliver encounters in the Voyage to Laputa, who have renounced language and who try to converse by means of objects themselves. Most days I'm with Stravinsky. An impulse to say something disappears into the steady progression of sentences. In the end, something is smothered by the necessary requirements of writing. Words are written, rhetoric deployed, but the impulse remains. There is no end. There's always a dual sense of writing being both a release and a dissipation. How can one remain true to that impulse, the inspiration, within the inevitable wandering? This was a problem also faced by Proust. "My volume is a picture" he wrote. "It's true that a picture is necessarily seen however large it is, whereas a book isn't read in the same way." His solution was one of the two usual ones: to write a great deal. Except that Proust made the dispersal work to make present the miraculous transports in which that long time is erased, the transcendence of time in which the dispersal becomes possible. It returns the novel and its readers to the inspirational origin. Actually, this might serve as the distinction between the exemplary literary status of In Search of Lost Time and the innumerable, interminable genre cycles some wish also to call "Proustian". For one the dissipation is the goal, for others, like Proust, its negation is a joyous, immanent inspiration. Yet as Christine Cano reveals in her new book, Proust's ambition caused problems not only with his early readers but his publishers before the work even got to the printers. Proust's Deadline takes us back to the time when Proust was writing against time to complete the novel. One gets a strong sense of the urgency and confusion of his negotiations with publishers. They would announce volumes in accordance with the author's advice, only for Proust to change tack as the writing proceeded. And although Proust wanted the novel to be judged as a whole, the first book - Swann's Way - was not well received precisely because it wasn't a whole. To contemporary reviewers it was a self-indulgent meander without a clear development and satisfying conclusion. They complained that a few moments in the life of the narrator could take 80 pages to describe. Of course this is still a complaint from those who wish the writer to suppress any instinct to tell the truth as the book sees it and instead do a professional job for the indignant reader. But Swann's Way would have appeared less abnormal had the later volumes been there to put it in context. The work of art should spring forth in a single jet; it is the impossibility of saying everything at once, or the difficulty of expression, that force the artist to work successively. To disguise this, this succession of efforts, to reproduce in each detail the work as a whole, this is the entire secret of art. Simultaneity is thus redefined as growth of the parts in relationship to one another, that is, as the internal logic behind the artist's necessarily successive efforts. It is successivity, then, not simulaneity, that is only as an appearance. This has obvious resonances with In Search of Lost Time. Except it doesn't explain why Proust was so dissatisfied with Jean Santeuil, his first attempt at a great novel, so similar in many ways to the later work, that he abandoned it even after writing several hundred pages. To explain that, I can only point to Blanchot's essay The Experience of Proust (in this collection). It is there literary criticism and great art also become simultaneous. In the New Statesman, Ursula Le Guin defends fantasy in fiction. She says that by the mid-19th Century, when literature was dominated by realism, fantasy literature, "in which magic works, or animals speak, or the laws of physics yield to the laws of the human psyche", took refuge in children's books. It flourished so well there, she says, it began to be perceived as being for children only. The modernists extended this misconception by declaring fantastic narrative to be intrinsically childish. They did? Which modernist made this declaration? Le Guin leaves us guessing. Was it the author of A Report to the Academy, The New Advocate and Josephine the Singer? Maybe it was that arch-modernist from Buenos Aires who wrote Tlön, Uqbar, Orbis Tertius? How dare they look down on talking animals and fantastic tales about physics! The publication of the translation of WG Sebald's remarkable essay on the Allied airwar on Germany coincided with the invasion of Iraq in 2003. So it was no surprise the reviews were defensive not only of the 60+ year-old Allied campaign but of the one in process. For example Daniel Johnson assured us that while strategy might have been more important than morality in World War II, since then "the overriding aim of American strategic doctrine ... has been to avoid enemy civilian casualties". Which will come as a great relief I'm sure to the relatives of the dead in this city. (I've written more elsewhere about Johnson's shameful review in a long essay on Sebald). So when I saw that an English edition of Jörg Friedrich's The Fire, subtitled "The Bombing of Germany, 1940-1945", was about to be published, a book which Sebald didn't live to read but which brought about the catharsis in German society he had recommended, I thought: uhoh, here we go again! While the reviewer's are likely to be less thirsty for Iraqi blood as they were in 2003, they will no doubt use the incontrovertibility of the one to win back some credence for the other. Bombing German cities into a wasteland was terrible: anyone reading Jörg Friedrich's book [...] will be in no doubt of the cultural destruction and human suffering that it caused. For many Germans, the experience of reading the unvarnished awfulness of their own, their parents' or grandparents' wartime experiences was cathartic. The translation will fill a gap in contemporary understanding in the English-speaking world of what happened in the air in the second world war. Mr Friedrich deserves credit for both his diligence and his descriptive powers. The author's outrage, and the sarcastic and melodramatic prose that this fuels, dims any understanding of the context in which Winston Churchill and his air chiefs decided that the air onslaught on German cities was the best (or least bad) course of action, and stuck to this even when the cost, to both bombers and bombed, became increasingly awful. While this looks bad for Friedrich, I would ask how much that initial catharsis is dependent on the lack of varnish and excess of tone and outrage? Can one happen without the other? The review ends with the usual feeble resort: "Mr Friedrich's desire to puncture Anglo-American self-satisfaction comes perilously close to suggesting that the Germans were right to defend Nazism, and the allies were wrong to attack it." But those, like The Economist, whose leader this week exhorts the US administration not to withdraw from its occupation, those who wish to distance themselves from apparent Fascist-appeasing demagogues, might be interested to learn that in his Afterword to the English edition, Jörg Friedrich says he supported the 2003 invasion. Andrew Hussey's sideswipe (it can hardly be called a review) at Jonathan Littell's novel Les Bienveillantes leads to one conclusion: that its success is due to the French public's wish "to read about anti-Semitism as a historical phenomenon in a blockbuster ... than to face up to what is happening around them". He means the "wave of anti-Semitism in Paris". Gosh, who'd have thunk it: literature as escapism? But couldn't one also make the same argument that is also escaping another current phenomenon: a Christian crusade against Islam and the virulent spread of Islamophobia across Europe? After all, the former has so far led to half a million dead in Iraq, possibly half that in Afghanistan, and the latter can be read in newspaper headlines everyday. I admit these figures aren't as clear as Hussey's. He refers to two victims of this "wave". One is even given a name, the other, one of the alleged perpetrators, is not. Either way, the review doesn't tell us much about the novel in question. Not that the reviewer is terribly interested anyway. He's more concerned with lording it over fuss surrounding the success of the book - a fuss based mainly on smug articles that say things like Les Bienveillantes is "a genuinely popular bestseller - a quality rarely associated with winners of the Prix Goncourt, which have been distinguished in recent years by their tedious unreadability". An example anyone? The point of these high-cultural trappings is to remind readers of the well-worn notion that immersion in European civilisation is no barrier to the worst acts of barbarity. It is this idea that drives the narrative, and so, as the massacres pile up, characters exchange stilted dialogue about the metaphysics of evil. As it's impossible to feel any empathy with Aue [the Nazi officer], who emerges as no more than a narcissistic aesthete with a taste for cruelty, the intellectual posturing appears in increasingly questionable taste: the stench of the real dead is masked by literature. Aren't you curious that the novel's narrative drive is borne on that apparent opposition? Maybe that's what makes it so different from all those unnamed tedious and unreadable prize-winners. Hussey isn't curious and seems to have a problem with resonant allusions in general, as if the intellectual posturing was Littell's and not his characters'. Those who have praised Littell point out that he is a student of Georges Bataille, Maurice Blanchot and Sade - a fact that still confers intellectual respectability in Left Bank circles. These are controversial influences - it is possible to read both Bataille and Sade simply as advocates of extreme cruelty, and Blanchot's anti-Semitic past still provokes debate. John Fletcher is quite wrong to allege that the late Maurice Blanchot was "writing virulently anti-Semitic articles before 1939 and even well into the 1940s". Out of the many hundreds of column inches published by Blanchot in the press in the years up to 1940, there are perhaps no more than three or four brief passages signed by Blanchot (though not necessarily all written by him) that, on a severe, retrospective reading (such as the writer was wont to adopt in later life), may be construed as making some limited appeal to contemporary anti-Semitic rhetoric. None, by the standards of the 1930s, is particularly virulent, and all date from 1936 or 1937. More worthy of note is Blanchot's unequivocal condemnation, in May 1933, of the "barbaric persecutions against the Jews" then taking place in Hitler's Germany, which, Blanchot points out, were bereft of all political purpose, other than to create a demagogic, mystifying smokescreen behind which the regime might conceal its political deficiencies. And Blanchot ended his piece, as he would throughout the decade, unlike Robert Brasillach, whom he detested, by warning against the threat that Hitler's militarism now represented for the rest of Europe. Blanchot's potential literary influence on Littell, an influence that would surely rest entirely on his post-war career, such as to be found in his book Lautreamont & Sade, would make for an interesting piece by someone with a feeling for the rich complexities of French thought and French literature. Failing that, Andrew Hussey. I've changed the blog template courtesy of the remarkably-named Blogger Templates site. How could me resist a template called Beckett? UPDATE: I've noted that this new template background looks black on some PCs. On my iBook it is definitely not black (though what colour it is remains a mystery). Apologies for the unintended blackness. I'll try to improve it (though I am to HTML coding what Suite Française fans are to sound judgement). "[T]he narrative is constantly shape-shifting. Readers, if they are to survive, must surrender completely to the undertow of its myriad jostling currents. 'Modernist' is precisely what Against The Day isn't" says Jonathan Keates, as if the first two sentences necessitated the mitigation of the third. But it's explained in the fourth. The cumulative effect of Pynchon's performance is one of aching nostalgia for the expansiveness of the novel form in its 19th-century glory days. Novels were expansive only in the Victorian era you see. Tristram Shandy was actually written in 1880. Tom Jones a year later. And Don Quixote really was written by Pierre Menard. Sarcasm aside, if Keates is right about the origin of that effect, then it rather supports my suspicions about the essential conservativism of much "cult" fiction. We need to face up to it: a terminal loss of confidence can't be masked even with 543 sheets of paper. Last weekend I watched the drama documentary Touching the Void for the fourth time. If I were an enthusiast, I'd clap hands and say: what a great film! Then perhaps compare it with other examples of the genre, discuss the merits or otherwise of each, and leave it at that. But I'm not an enthusiast. All I want to know is: why the hell did I watch it again? The only answer, apart from the facile one, is that, for all the filmmaker's painstaking attention to making or remaking an extraordinary and inspiring story, I am always left wanting more. Something is missing from the film. Each time I watch it again there's a compulsion to look again for what's missing. And be frustrated again. Presumably it is the void itself that is missing. But when is it touched? Perhaps when Joe contemplates the abyssal descent into the frozen Sarlacci pit. Yet as we know that saves him, it is merely an imagined void, not the void itself. As we look down, we're always left with the residual energy of frustrated foreboding. Is that non-experience the void? Maybe it's below the false floor of the crevasse, creaking beneath Joe's body as he crawls toward the light? Later, as we watch Joe clambering over moraine, he says in voice-over that it wasn't survival he sought so much as company. He didn't want to die alone. This is incredibly moving. He needed a witness. Otherwise his life would be the void; the story would then be the void itself and we would never hear it. And yet, because he found company and didn't die, the story can only be about what was avoided. No wonder there's something missing. Most glaring of all, what's missing is the end. The narrative stops as soon as Joe has been hauled into the glowing tent. Isn't that really where it should begin? Perhaps the interviews stand for that time when suddenly the void has past. The story itself, however, is never past. It rests upon the void which is now always missing and for which it is always searching.